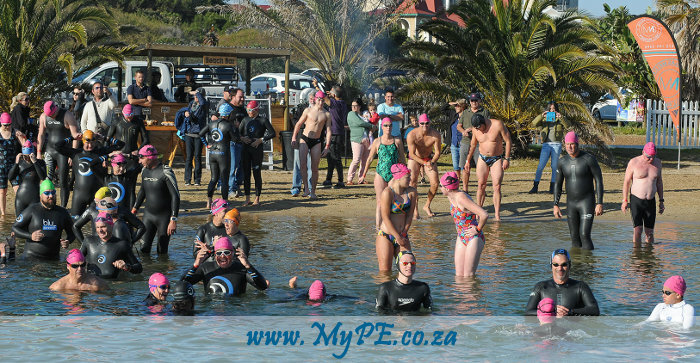 The JBay Winterfest continued yesterday despite the Corona Open being placed on hold as over 50 swimmers took on the challenge of completing the Cold Water Swim Classic presented by Nicholas Melck. The 12 C water was always going to take its toll, with four swimmers having to withdraw from the event due to hyperthermia, while 54 swimmers managed to finish one of the most extreme events in South Africa. With an air temperature of 19 C, conditions on land were a stark contrast to the icy water that awaited swimmers from all over South Africa who descended upon Jeffreys Bay to take part in the Cold Water Classic. Only three swimmers entered the costume division of the triple mile, an official Robben Island crossing qualifying swim, with Port Elizabeth veteran PJ Duffy winning the men’s section, while Pretoria’s Megan Albertyn winning the the women’s division. Jeffreys Bay swimmer JC Van Wyk won the double mile while Paige Black won the women’s section of the event. 12 year old East London swimmer Mbali Vellum in his first cold water swim had to tough it out to complete the double mile and in the process the award for the youngest male participant on the day. Event owner Brenton Williams said it was a hard swim for Mbali and the 12 year old had to dig deep to finish. “We noticed Mbali from the safety boat after he completed his first mile loop and decided to keep an eye on him. Initially it looked like he was really battling with the cold but his stroke was consistent and we decided to give him every opportunity to complete his swim. The Cold Water Classic is all about challenging oneself and Mbali did exactly that and didn’t falter throughout his swim,” said Williams. “The water was very very cold but I really wanted to finish the double mile,” said Mbali after his courageous swim. “My goggles kept leaking and I was stopping to fix them and the guys on the boat were always encouraging me to keep swimming and that I was doing well”.